WARNING: This article contains spoilers for Captain America: Civil War. 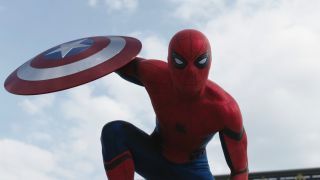 One of many highlights in Captain America: Civil War is the introduction of Tom Holland's brand new Spider-Man. The wall-crawler will be getting a standalone film next year, and it was recently confirmed that Iron Man himself Robert Downey Jr is set to star. We see a little bit of the dynamic between Tony Stark and Peter Parker in Civil War, and that relationship will continue to develop in Spider-Man: Homecoming. "We cast an actor who is very close in age to a high schooler", Civil War co-directo Joe Russo told IGN. "Tom is really the first young actor to portray the part, and he has an incredible vulnerability and a certain confidence married together that create this very youthful and exciting character." I’m a big fan of the Stark/Parker pairing; Holland and Downey have an easy chemistry with each other in their brief (but memorable) scene in Civil War, and having Tony mentor a young hero brings a fresh dimension to the character. It's going to be interesting to see just how much screen time Downey has in Spider-Man: Homecoming, and how much of that time he'll spend in the Iron Man armour.